Honoring the first Tokugawa shogun of Japan--Tokugawa Ieyasu, an intriguing master of kenjutsu and military strategy who survived 90 battles during his long and tumultuous life, loved hawking, and habitually bit his nails--this sword is actually typical of many that personify the famed general. In small ways they may be historically accurate, but in this instance the power of the man completely overshadowed the details of the sword. 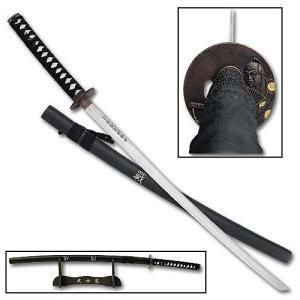 Today there are many varieties of display katanas claiming to replicate his personal battle weapon. This sword shares a feature common to many of these replica katanas, a tsuba or hand guard embossed with the portrait of Ieyasu and a stylized pictogram signifying a garden hut. Although he was a master of war, he aspired to peace and the fine arts of life. This forty inch katana, a full tang sword with a tempered carbon steel cutting blade 27 1/2" long, features a tsuba of cast metal and an etched Japanese inscription on the blade itself. The handle is wrapped with cord in a fish bone pattern, which gives the wielder of the blade a secure grip. The wooden scabbard is engraved with symbols of Ieyasu's reign. A matching black wooden display stand comes with the sword for wall mounting.